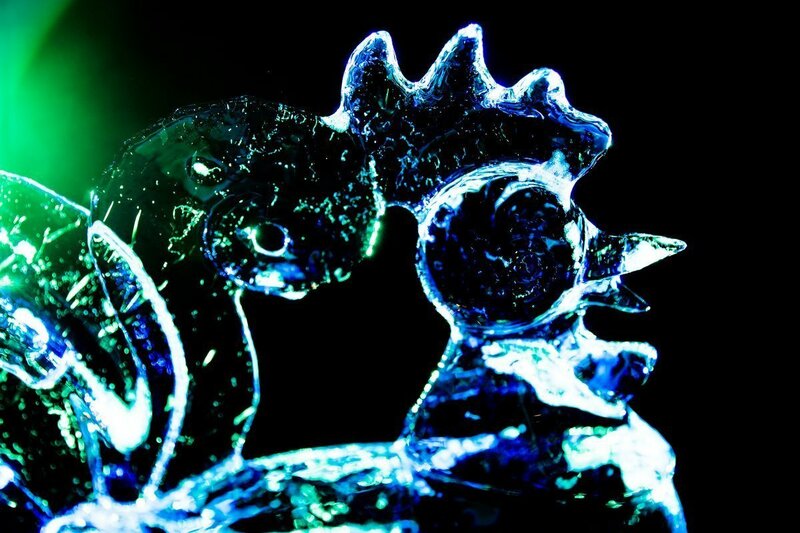 The words “ice sculpture” commonly bring to mind the image of a swan with its long, smooth neck and cold, clear wings poised on a banquet table. 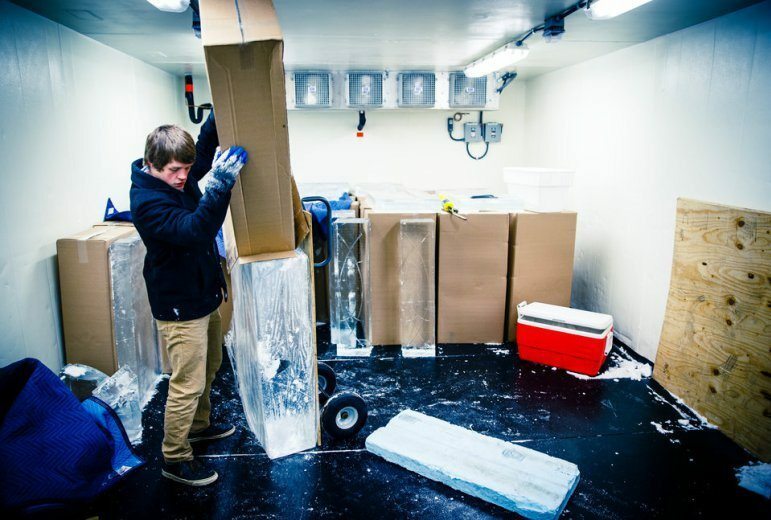 Entrepreneur senior Robbie Harrell and his Minnesota Ice Sculptures business are working to dismantle that assumption. He and business partner Cullen Loeffler manage the promising company, which just celebrated its first birthday. One of the company’s recent projects, a 30,000 pound, life-size boat sculpture, certainly was a far cry from a swan. An unexpected phone call from the Minneapolis Boat Show organizers led to the project which, according to Harrell, was one of the largest ice sculptures in the Midwest. They began the hand-carved creation by stacking 100 blocks of ice five layers high on a plywood platform – 16 tons of ice and an almost 12-hour task. With the work of Harrell, four other Minnesota Ice Sculptures employees and a professional carver flown in from Texas, the project took nearly 160 hours to complete. While the initial plan was to use the company’s unique computer numerically controlled (CNC) ice carver, late approval on freezer permits led to the decision to hand carve. “Definitely an exhausting project, but once we got everything set up we just kind of went at it,” Harrell said. Minnesota Ice Sculptures has undergone big changes since its debut. Harrell began planning what would become Minnesota Ice Sculptures with his friend Stu Lombardo ’14 two summers ago. Lombardo was the front-runner for the CNC, and the two formed a business plan and pitched it that year. By December 2013 they had opened their doors and begun to sell sculptures for New Year’s Eve from the garage of one of Harrell’s rented properties. After Lombardo left the company to pursue other interests, Harrell never imagined he would find a new business partner on a flight to Texas. When a woman in Harrell’s row changed seats, he ended up sitting next to a Loeffler, a Minnesota Vikings longsnapper. Once the two started chatting, Harrell mentioned his business and the recent loss of his co-founder. In a case of perfectly timed coincidence, Loeffler had been looking for a small business in which to invest: The meeting led to a St. Thomas alumnus and professional football player joining together to run an ice-sculpting company. Harrell recounted another twist in the story – he and Loeffler are actually second cousins. The two view it as a strange kind of fate. While Loeffler helps spread the word about Minnesota Ice Sculptures and handles the strategic and financial side of things, Harrell runs the day-to-day operations. In the beginning, Minnesota Ice Sculptures was run out of a rented garage. The company since has found a manufacturing site and walk-in freezer for blocks of ice in Shakopee. Their main base of operations is in Minneapolis. “Now we can walk out our door and look up at that beautiful Foshay tower,” Harrell said. Harrell hired one of his employees, Mark Lawson, because of his experience with machine carving wood. While Lawson was hesitant about working with something as fragile as ice, he was hooked instantly the first time he used the Custom Ice Carving Machine. Lawson was drawn to Minnesota Ice Sculptures because of Harrell’s passion for the company, so he joined the team full time. Lawson loves the challenge and excitement ice sculpting provides. A typical day at the company involves unpacking blocks of ice and cutting them to size, working on patterns and 3-D modeling for sculptures, programming the CNC and delivering sculptures to customers. According to Harrell, there are about 75 ice-sculpting companies in the Midwest. He said his company is the largest in the state. Minnesota Ice Sculptures has come along faster than anyone anticipated. Harrell said perseverance and the hope of someday having a large-scale manufacturing plant that would deliver sculptures across the nation keeps him and his employees motivated. 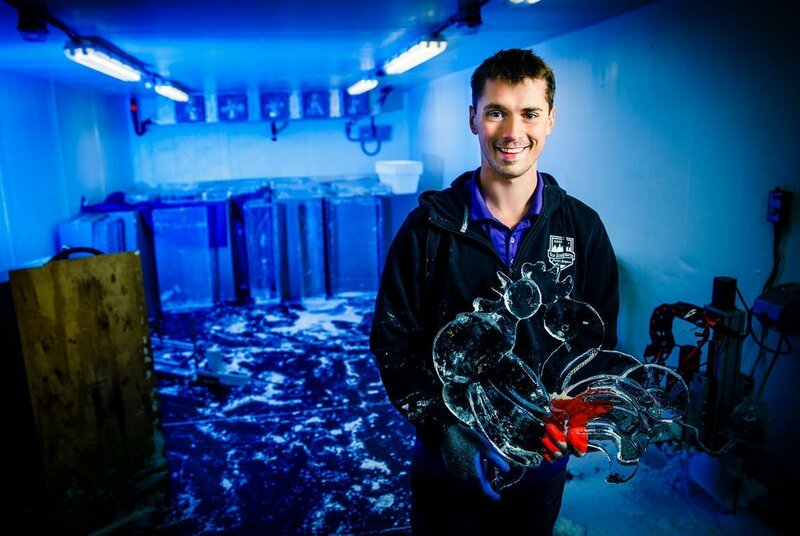 Purple is a familiar color in the workplace: Most of the Minnesota Ice Sculptures employees are St. Thomas students or alumni. As an entrepreneur himself, Harrell had friends in the field who wanted to see how a small business worked. Minnesota Ice Sculptures launched an internship program last summer to give prospective employees a hands-on approach. “One of our big goals over the summer was to get a handful of interns/employees in and have them kind of help us out, see the inner workings of a company and from there just kind of get a feel for working in a small business,” Harrell said. Even with their thick blood and strong willpower to survive cold winds and heavy snowfall, Minnesotans can get tired of dreary winter days. One of Harrell’s main goals is to brighten up our monotonous weather. The company’s plan is to enhance Minnesota winters by creating a tradition of colorful ice sculptures. One way to do this is to freeze live flowers in ice and cut out a vase for them that will last all winter on a customer’s doorstep. Harrell was drawn to ice sculpting by its ability to bring color, joy and excitement, and he loves when he can do that with his pieces. Minnesota Ice Sculptures’ young journey has been a momentous one, filled with a wild turn of events and opportunities. To Harrell, ice is a perfect metaphor. It melts and disappears just like time, or a special event, does. “They know it’s melting; it’s going away. So it’s this perfect little representation of that current moment,” he said.